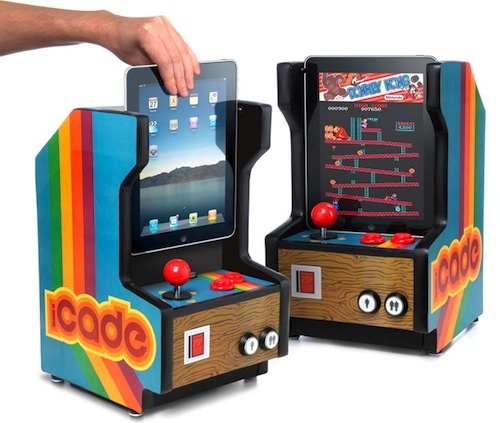 iCade Turns Your iPad Into A Mini Arcade Machine | OhGizmo! I’ve not really been too excited about the iPad, for reasons that I’m not even going to bother listing here. I figure it’s easier to list reasons why I would want to get one of those for myself. So easy in fact, that I only have to name one thing. The iCade. The iCade is an arcade cabinet accessory for your iPad. Just slide it in, fire up the iCade app and start playing one of the included classic games. There are hundreds to choose from like Dig Dug, Donkey Kong and QBERT. The accessory uses your iPad as the screen, while giving you a joystick and a pair of buttons. You even have the option of selecting one or two players. $150 is a bit salty for an accessory, but would be well worth it. Nope I'm saving my money for their tattoo machine. I <3 thinkgeek. I was truly heartbroken when I realized what today was after I saw the iCade. If this is fake it should be real as it's the best idea ever! If we're lucky they'll end up actually making something like this, as they have with previous gag products. I agree with you. but awesome idea! Was this product not an april fools joke? Sweet – now i can buy it. Awesome peice of kit – we just blogged about as one of the most bizarre ipad mods around.